Practicing with sharpies in order to cut down on details and simplify the artwork. Way late in posting these drawings from my November(!) class. The last class was a bit weak for me. Fairly happy with the last two in terms of the shading and getting some nice depth (in some areas) if not quite anatomical correctness. I think if I would have had an hour on these, they might have been pretty good. I'm a little behind on posting these class sessions. 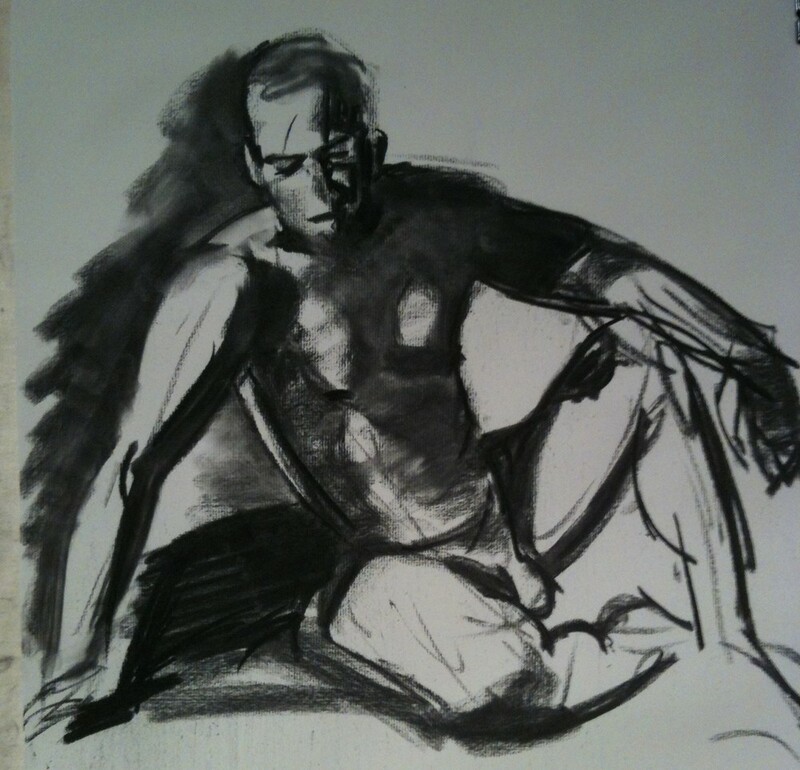 The following are all charcoal drawings, starting with some gesture drawings of about 1 minute, and followed by 10 and 20-minute drawings. I can't remember which are which at the moment. In the longer poses, I try to look for the big shapes of black or dark areas and get them down on paper quickly---without trying to get it exactly perfect. Once I have the major "blobs," I go back and refine by trying to see (and making) more tonal differentiation between areas. I do try to think of the lights and darks on and around the figure as "blobs of light and dark" instead of "leg" or "arm," because thinking about those areas as specific parts (for me) triggers the icon of "arm" in my head, which is not what an arm *really* looks like. These are probably a 5-minute pieces. I think these are getting into 20 minute poses. This one starts with a gray charcoal background and picks out the whites/lights by pulling charcoal off the page. I was getting close to getting her right hand in good shape, but ran out of time. 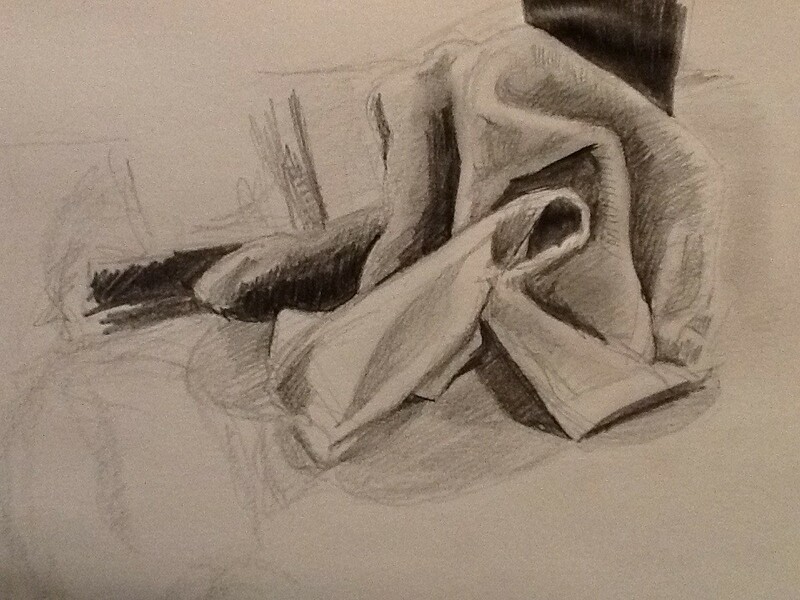 Tried a different charcoal this time, denser/harder, didn't care for it as much, although you can get a sharper line. These are 1-minute drawings. These are 2-3 minute drawings. I think these are around 5 minutes. These are getting into 10-20 minutes. 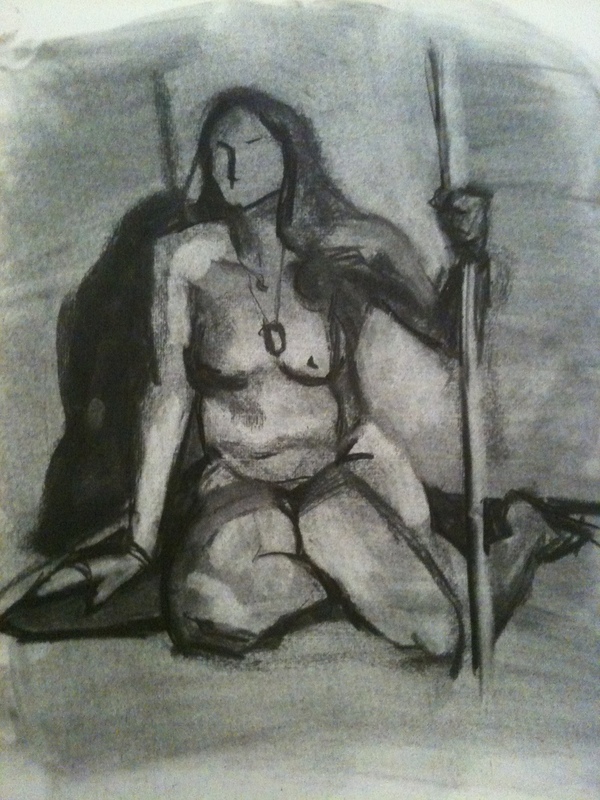 Here and in the next one, I started by covering the page in charcoal so that I was working from a medium gray tone. That is helpful because you can then "subtract" black from the page for the lighter areas (although it can be difficult to erase charcoal effectively). Subtracting is useful, because there is not a lot of shadow to work with; and with the light skin of the model it can sometimes be "easier" to compare the gradations of light tones than to find darker ones. With all the hubbub of ZineFest, I forgot to post my class work last week. We had an extra treat this time: two models! In addition, these guys (one guy, one woman) were really interested in trying to make interesting compositions. I know that I could never sit still long enough to be an effective model, so I even appreciate bad ones. But when you get models who are interested in their craft, it really makes a difference. These are all done in charcoal. I think this one was 20 minutes. 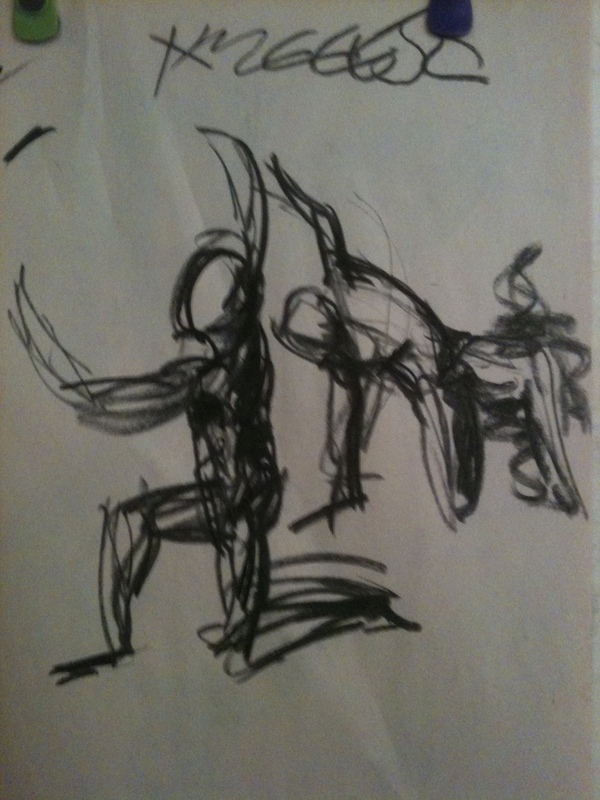 2-minute gestures. Here I'm trying to capture just the big blocks of light/dark, not worry about lines/contours. I think these are getting into 5 to 10 minutes. 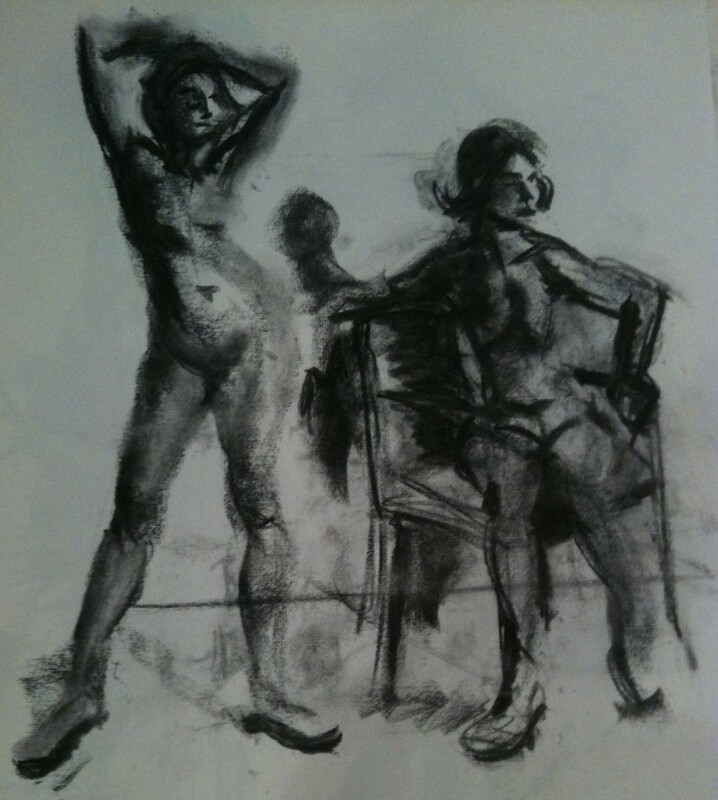 Class #2 of Figure Drawing. I'm not as happy with these this time around; they are too incomplete. I think I'm doing okay with capturing the contrasts (lights and darks), but the overall figure still looks wonky to me. These are all done in charcoal. 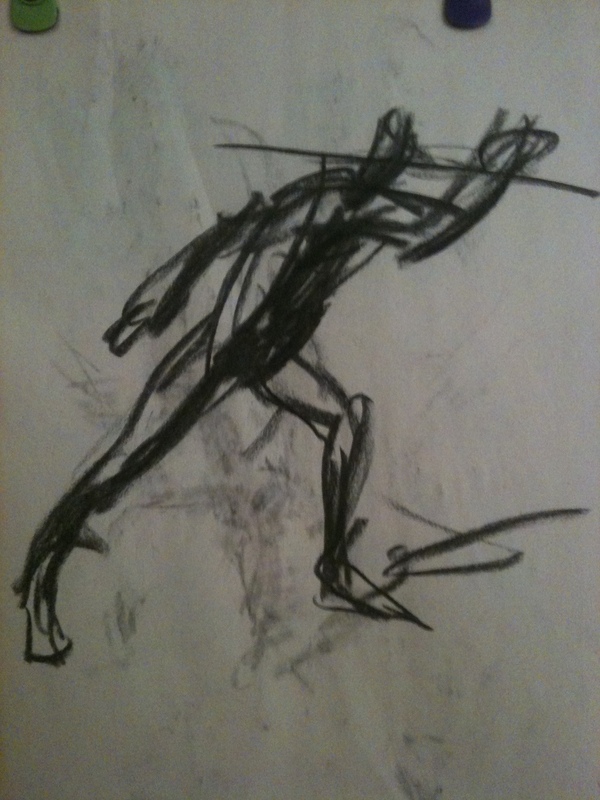 We started with some 1-minute gesture drawings. Moved on to 2-minute drawings. I think these are getting into 3-minute drawings. I think these are getting to 5-minutes. I think these are getting to 20-minute drawings. I wasn't feeling terribly there this day and after some initial distraction of having a beautiful woman naked before me (and a room full of mostly male artists) I was able to eventually capture some shapes and lines, but am displeased by most of it. I didn't know where to begin a bunch of the time. I think the one thing I may have done well was capture the model's expression a few times. She had a serenity I liked and seemed to focus on. Otherwise proportions are a mess. Perspective is a mess. I've just got to keep trying is all and some day it may just all work out. Cej, when is the next one? 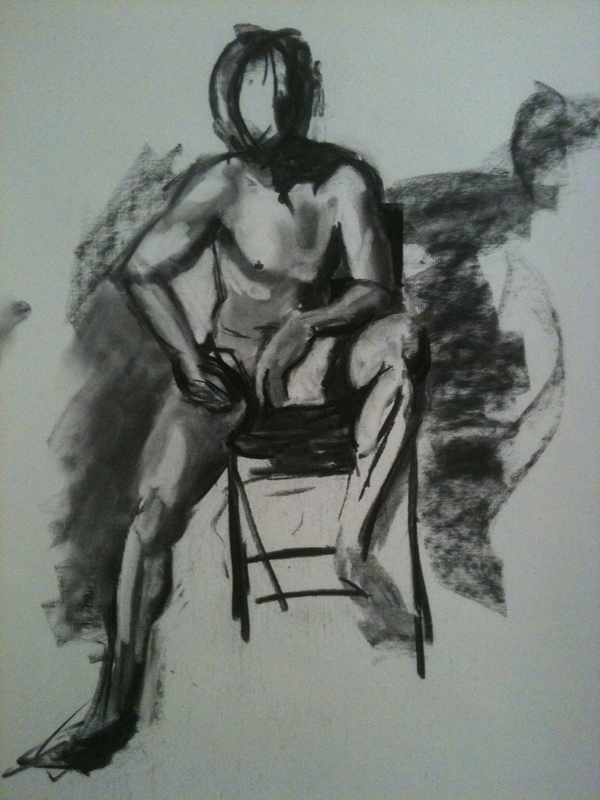 So I enrolled in another figure drawing class. Here are some of the results from class #1. 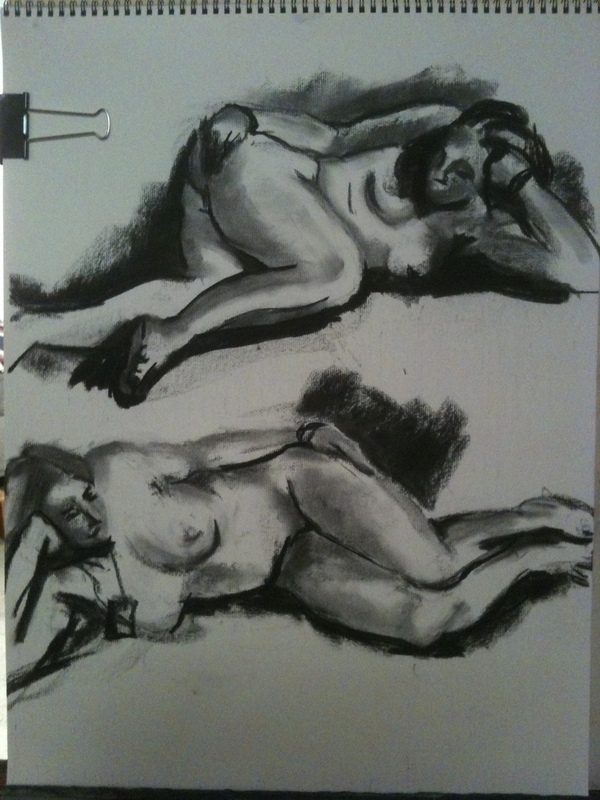 These vary from 5 to 20 minute drawings (I forget which is which). They are all done in charcoal. It's been awhile since I used charcoal. It's pretty messy, but also pretty forgiving. That is, even crappy work can look decent (case in point). By the way, there was only one model, but I doubled up on several of these, because paper is expensive! I also need to remember to take pictures as I go, because charcoal smears very easily, especially when you are flipping pages and drawing on the front and back of each page (not that I'm using that as an excuse, mind you). Yikes! I can tell it's been a month since I did any drawing. Already getting rusty. Sunday should have been studio time, but I happened to notice that AvantGarden was hosting its monthly drawing studio, which is something I've wanted to go to for awhile. With Hardtraveling Hero in town, I figured I could tempt him to come along with the prospect of naked bodies. Below are some of my drawings from the event. Hopefully, I can persuade Hero to post some of his. I've been avoiding this particular Calimbo page. The forced perspective and overlapping blacks have been kind of terrifying. But I'm running out of reasons not to work on it, so I dove in. 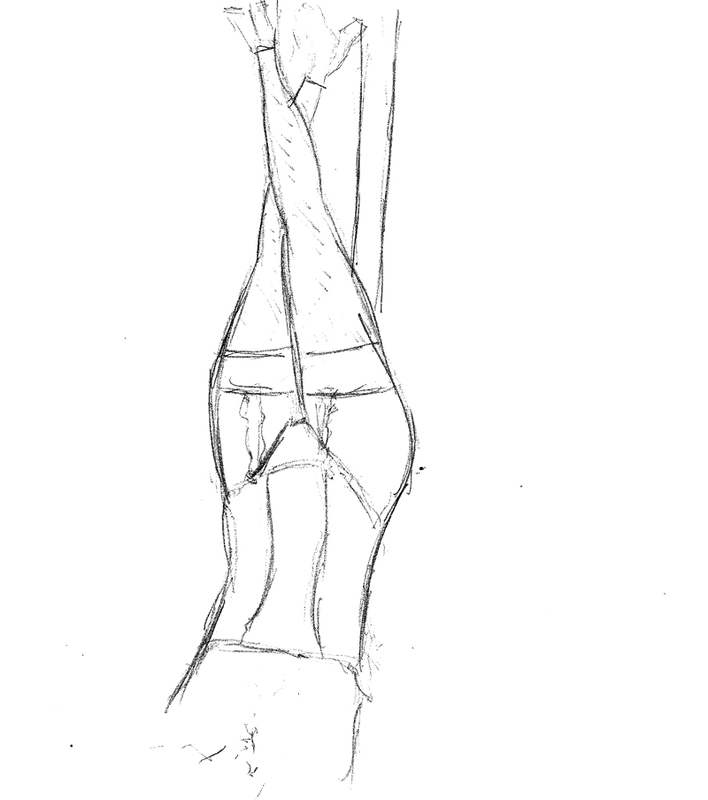 You can see that I did a full-size-figure-it-out pencil sketch first. I used to do this kind of thing more often, but I've gotten a bit brazen (or just lazy) recently and have skipped this stage. I figured there would be just too many mistakes/too much erasing if I went straight to the page. And the indentations that the pencil/eraser makes put difficult wear on the paper. Anyway, it's not quite looking correct, and I'm still figuring things out, but I should be able to finish this one up in the next session. The final "in the field" Drawing in Pubs class was at Kennealy's. It's an Irish bar that serves a mean pizza. Unfortunately, I didn't find much in the way of things to draw. This one is a shot of the main bar from the next room over. Then I went small and focused on a napkin. My Drawing in Pubs class was at McElroys which is an Irish bar with lots of wood, leather and darts. This first one is done with white and gray chalk on black paper. Chalk is not really my favorite medium, but I do think there's lots of value in working on colored paper. It may be hard to tell, but this is a table and chairs. This is a side table and lamp done in pencil. 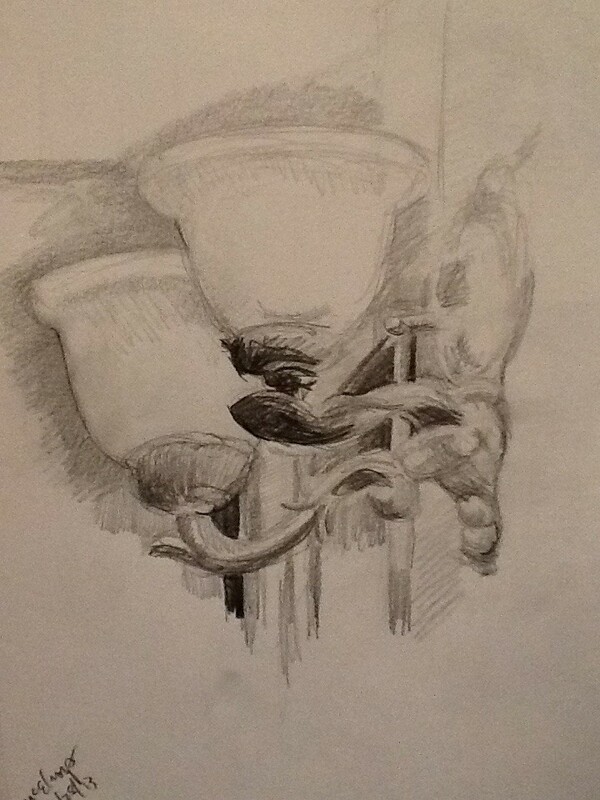 And a light sconce in pencil. As a way to keep myself disciplined, I thought I'd publish whatever I got accomplished during my (typically) weekly studio time. This will become a Calimbo page. Hopefully, I'll finish inking it next week. This week's class was at The Harp, which is an Irish bar with wood and some neon. Whitney (the instructor) was nice enough to pose for us. 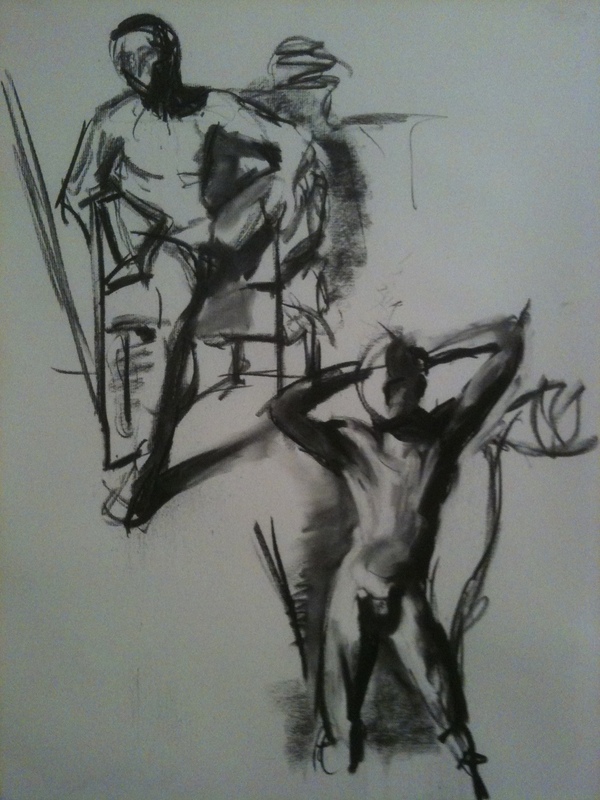 These first few are 1 minute drawings in charcoal. I'm not sure you can even tell what's in the picture. 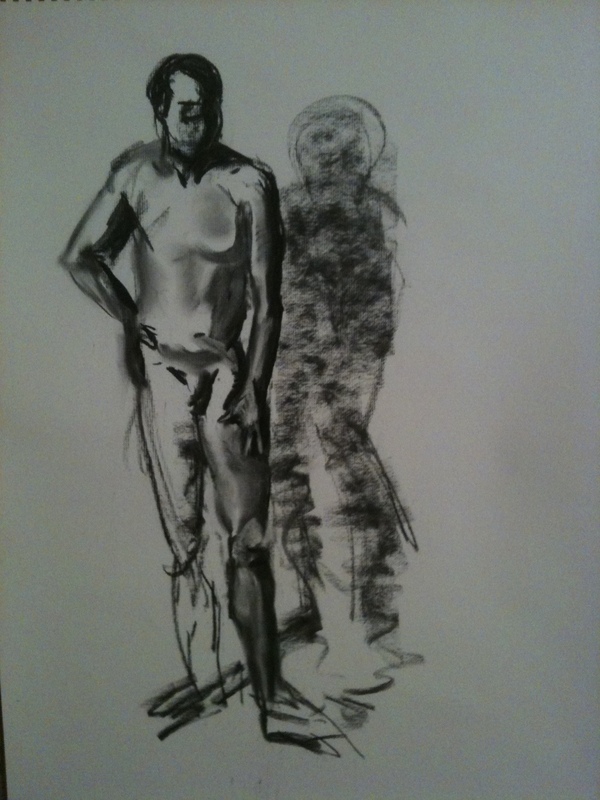 These next two are twenty minute drawings done in a mix of pencil and charcoal. Finally, just some random people and things around the bar. Here's the sketches from my 2/14 Drawing in Pubs class. These were done at Art Nouveax, a nice little place with old school hurricane glass lamps and light fixtures everywhere. This first one is a chair. The difficulty is getting the subtle transitions between shades that are so very close to one another. This is done in pencil. For the next one, I deliberately choose a still life that was rich in detail. This is a side table underneath a lamp (the tree trunk-looking thing) with a bottle and chord and some leaves from another tree. This is also done in pencil. The challenge here was details with bright highlights and deep shadows. My Drawing in Pubs class for 2/7 took place at the Black Lab (short for "Labrador"), which is another British style pub---although not as dark as I remembered it being. I worked on perspective here. 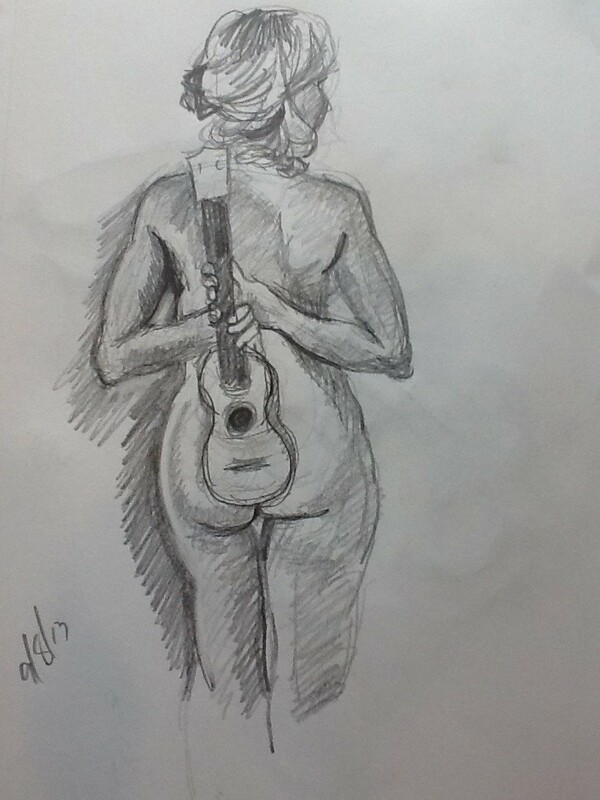 This image is a pencil drawing from sitting at the bar and looking into the room on the other side. My 1/31 class of Drawing in Pubs took place at Rudyards an old favorite of mine. Lots of wood and darts! This time we focused on perspective, one and two-point. I enjoy drawing perspective, but I never seem to get a good position for my vanishing points. This first image is of a corner behind a booth corner with part of a staircase in between. It's a real mess. For the second drawing I went "simpler." This is the edge of the table, part of the booth, and the bin behind it. I think it looks okay---you just can't tell what it is!